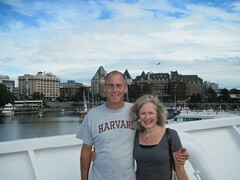 It has been six years since Esther and I have visited Victoria. This weekend being our anniversary, we made a weekend overnighter to the enchanted city. It never ceases to amaze me how ‘European’ Victoria feels so close to us. I love entering the city from the harbor. We took the 12:45 Coho from Port Angeles and jumped into an afternoon of strolling, shop browsing and dining before retiring to our ninth floor hotel room at the Coast Harbourside. The pounding rain in the middle of the night didn’t give us high hopes for Sunday’s weather, but we were pleasantly surprised by sunny skies by late morning. We enjoyed a delicious brunch buffet, which gave us the energy to walk the harbor perimeter, including the fisherman’s wharf which has had some upgrades since we visited last. Another change that we noticed this time was the prevalence of the cruise ships. During our 25 hours in the city, we saw five different large cruise ships drop off their teaming tourists to terrorize the town. We caught a 3:00 ferry back to PA where it was pouring down rain. Once again Victoria delivered on a romantic getaway.